As an emergency responder, immediacy is your primary goal. With your sense of urgency when duty calls, safety is also a top priority. When you are quickly backing up something as immense as a fire truck, it can sometimes be difficult to establish a thorough view of what is behind you. That’s where Tadi Brothers comes in with our 7" Wireless Ultimate Fire Truck Backup Camera System. When a fire or other emergency is occurring, every second counts. Save time by knowing what stands in your way by viewing each object in your path on the 7” LCD monitor. Each image that is displayed is delivered to you in strikingly vivid colors with lucid, clear lines. Four video inputs allow you to connect up to four cameras for optimal coverage of all sides of your fire truck. Select how you view your cameras by choosing full screen or split screen mode. This system even enables you to view four cameras at one time! Each of the three RV box cameras included in this system is 100% waterproof with military grade night vision. A wide viewable angle assists you in driving in reverse, parking, and making difficult lane changes on busyhighways. We understand that a fire truck is put through a great deal of wear and tear on a daily basis. 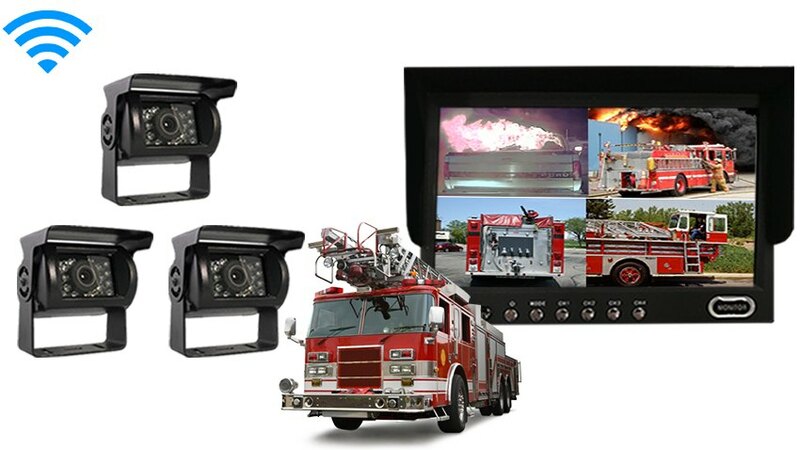 To prevent loss of operation during important runs, we have included our toughest built cameras with the 7" Wireless Ultimate Fire Truck Backup Camera System. The wireless feature of the cameras also prevents you from having to deal with all the hassle of extra cords and cables running through your vehicle. Increase your promptness and safety when it matters most with this exceedingly easy to install system from Tadi Brothers.